As often happens with passionate and unrelenting hobbyists - it takes a person who refuses to be satisfied with the status quo and will not rest till their aspirations are met, to bring about a significant change. Such is the tale of Darrel Hawthorne, who along with his wife Diana, in 2005 founded Hawthorne Audio. He had always been partial to the lifelike and unencumbered sound of open baffle designs. The trouble was finding drivers to suit this purpose and Darrel's specifications. The only answer was to have someone make the drivers to their spec, and after considerable effort and fortune Eminence Audio signed up for the task. Hawthorne Audio essentially sells coax drivers with a few variations and ancillary products, giving the consumer quite a range of options and configurations to choose from. The drivers come in either a standard "Silver" version or a premium "Sterling Silver" version. Also each of those coax units is available with a 10" or a 15" mid/bass driver. Hawthorne Audio also sells a 10" and a 15" matching woofer units call "Augies", that can be combined with the coax unit to provide more bass response if desired - plate amps are also available to control and drive the Augies. This review will focus on the 10" Sterling version, along with the 10" Augie units. The coax driver assembly consists of a 10" woofer with a heavy cast frame basket, 2" voice coil and 38oz magnet. The tweeter is a 1" throat compression driver with a titanium diaphragm. The included crossover is built on an outboard wood platform - one complaint here, the speaker connectors are sadistically close together. Both drivers are sourced from Eminence. The tweeter is also available from Parts-Express, and on their website the posted specs for this unit show that the free response peaks around 3500hz and is down about 10db by 20khz, my in-room measurements do corroborate this. For all its simple and non-exotic materials and even in-spite of the potentially difficult aesthetic of a wide face, the net aesthetic of the speakers is amazingly unobtrusive and even elegant - in a minimalist way. Once again Browning is proven correct - "less is more". Hawthorne provides quite an amazing breadth of options, allowing you to start small and build up as you desire. You can buy just the drivers and crossover ($160 ea as reviewed), and add on a variety of baffles ($700/pr for the Trio version as reviewed)if you don't care to build your own (see website), and add an Augie driver ($165 ea), and a 2 channel plate amp ($225 or $359 ea). Just the coax driver kit is call a Solo, and took less than an hour to unpack and put together. Add one Augie per channel with a plate amp and you have a Duet, add another and you have a Trio. The Duet and Trio were also easy to add on, though close attention needs to be paid to connections since no instructions are provided - and I admittedly did get tripped up once. Key to note is that the Duet and especially the Trio setups do get a bit messy, since there are a myriad of wires and an extra box or two to contend with. Also, key to note is that the plate amp does provide phase, crossover frequency and phase controls - just as you would expect with a quality subwoofer. As tested, the Solo version with Trio baffle would cost $975 per pair, $1275 for the Duet and $1600 for the Trio - not including the plate amp. All of my initial listening was done with the Hawthornes in the Solo configuration. I was immediately impressed by several aspects of this speaker's performance. Most of all, the speakers have a luscious, detailed and room filling presentation that was impossible to deny. And imaging was stunning, that combined with a deep and wide soundstage resulted in a very immersive listening experience. Instruments are reproduced with their full harmonic and resonant structure, and they do not seem as if they are being squeezed out of a box - the impact is certainly noticeable, especially with good recordings. 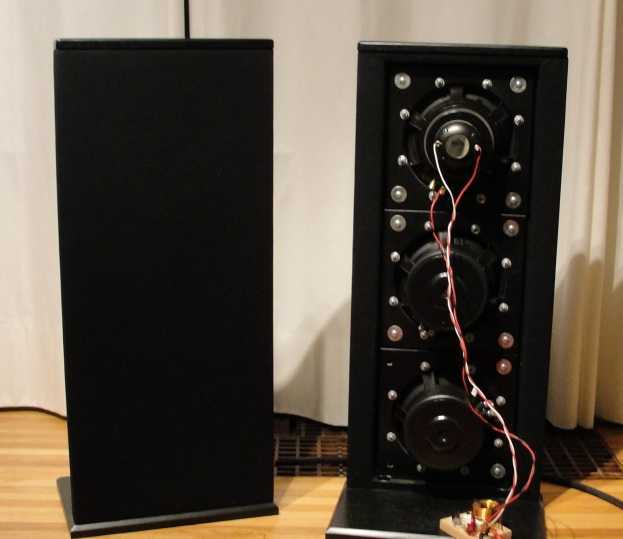 The frequency spectrum seemed detailed and extended through the spectrum, and the bass response was surprisingly extended for an open-baffle design that does not have a ridiculously large baffle. In-room pink noise tests revealed that the response peaks at around 500hz and seems to drop of significantly below 80hz and also gradually above 2khz. From my listening sessions I would never have guessed anything but a fairly flat response, some artifact of bipolar response must be the reason for this discrepancy in listening vs. measuring. I probably would have predicted a slightly down sloping treble response, since the speakers are never painfully detailed and very easy to listen to. This is a clever response design for a metal dome tweeter, this is the first where I experienced NO hint of fatigue. And if all of the above was not enough, I never heard the speakers compress or falter at high levels - and push them I did. Setup wise, I did find them best about 3' from the back wall and aiming right at the listening position. The layout I preferred most was an equilateral triangle placement configuration - i.e. the speaker and me all an equal distance from each other [about 8' in my case]. Since the treble response is not at all aggresive, it is possible and even desirable to aim the tweeters at the listener. I also got very good results when the speakers were only 4' apart and the central listening point still about 8' away. I used this layout when more than one person was listening, in my room I can squeeze 3 people side by side - and with the speakers 4' apart we each got a very nice soundstage, but of course not as nice as one person sitting in an equilateral triangle. In my experience it has always been direct comparisons that have worked best to really understand what a speaker can do. And in this case, I compared the Hawthornes to my long term stable mates - the Dynaudio Contour 1.3 MkII that sold for USD $2400 when last available, and the Triangle Electroacoustique Titus 202 that last retailed for USD $500. I use this track to test for reproduction of the clarinet. Relative to the Solo's, the Dynaudios were slightly smoother in the upper midrange on the clarinet; though the differences were obvious I think they would only be discernible through a direct comparison. Without that immediate reference, I don't think the difference would be noticed. When compared to the Triangle Titus 202, the Triangles seemed a touch constrained while the Solos let the clarinet project unencumbered and floating freely in space, the relative difference again was quite small. Focusing on the large bamboo flute, the Dynaudios again were just a bit smoother in upper mid-range to lower treble when compared to the Solos. The Triangles when compared to the Solos sounded a bit sharp and hooty on the higher notes and there also seemed to be quite a variation on playback level at different notes, this may indicate somewhat severe peaks and valleys in the Triangle's response. The Solos were so smooth and fluid, that I put aside reviewing for a while and listened to a few tracks instead. Listening to the Sitar solo on this track, the instrument's resonances seemed to project unrestrained thru the Hawthornes in the Duet configuration, whereas the Dynaudio's reproduction sounded a tad constrained. When compared to the Triangles, the Solos did a much better job of projecting this very complex instrument with all of its resonances, harmonics and detail. On this recording of a double bass, there was no question or surprise that the Dynaudio's had quite a bit more extension in the mid bass frequencies when compared to the Solo configuration on the Hawthornes but somewhat less than the Duet setup. And it then goes without saying that the Solos were considerably less extended than the Duets, but even still - with the Solos you could get a very reasonable reproduction of a double bass. On the same track when I compared the Solos to the Triangle Titus 202, the Triangles were no match in three important aspects. One, the bass extension was deeper and more effortless with the Solos - to the point of it being immediately evident. Secondly, the individual drivers of the Solos were seamlessly integrated, and the speakers projected the whole instrument integrated in time and space. In direct comparison, the Triangles projected a less integrated image - though there is not a lot on this track that is handled by the tweeter, the few clicks and pops were enough of an audible cue. Mind you this discrepancy in performance was quite minor, and I probably would not have noticed this without a direct comparison. Finally, the Triangles could not comfortably put out the same SPLs as the Solos - chuffing from the port became audible at moderately loud levels. I used this track as a test of male vocal performance. In direct comparison, the Duets sounded a bit hollow while the Dynaudio's were a shade warmer. To a very small but certain degree, I found the Triangles to be a bit boxed in or constrained, and the Solos were more open, natural and warm. This was a very surprising finding, since I have always held the Mid/Bass driver of the Triangles in very high regard in this aspect - another god knocked off its pedestal. On this track female vocals when presented through the Dynaudios sounded a bit more controlled, but not boxy - whereas the Duets were more open and room filling but maybe a touch less warmth - strictly a matter of preference here. I preferred which ever I was listening to and could not decide which one I liked better. A comparison to the Triangles had a similar outcome as on the track above. Female vocals reproduced through the Triangles seemed a bit more constrained and forced, and conversely more unencumbered and natural through the Solos - but the relative difference was even smaller on this track than the one above. Finally, I wanted to spend a bit of time dedicated to understanding the effect of the add-on Augie woofers. The addition of the Augie drivers and plate amp resulted in additional bass response in the Duet and Trio configurations. The resulting effect of adding each driver was to augment the bass response with a peak around 45hz and it was not till 30hz before the response really began to dropoff - the Trios adding more of the same than with the Duets. While that is quite an increase in bass response, I was able to get more extension and a slightly flatter response with my long time trusty ACI Force. And given that the ACI Force retailed for $800 when last available, compared to the incremental $690 for the Duet with amp or $1,380 for the Trio and the needed 2 amps - I would recommend getting a good subwoofer instead of going the Duet or Trio route. Listening to a variety of bass heavy tracks generally confirmed the same result, the Duet provided considerably more extension and SPL than the Solo. The Trio subjectively did not add much more extension than the Duet, but had the ability to add a lot more SPLs. So the decision on whether to go the Duet or Trio route would really depend on how much of a cavern you live in, I suspect a Trio would only be warranted in only the very largest of rooms - more like an auditorium maybe. When comparing the Duet to the Solo with my ACI Force subwoofer, there was not much of a difference in most instances. Only in tracks with the lowest of bass notes, was a very slight difference noticeable - the ACI delivered more extension, the kind that is more felt than heard and thus is harder to notice unless you are paying very close attention. All in all, the Silver 10" Solos are a very impressive pair of speakers. On the positive side - they have an amazing soundstage and imaging, and a rich and luscious sound. While the treble is not hyper-detailed, it is also not an iota fatiguing - allowing for endless hours of enjoyment. They are tremendously efficient, allowing you to focus on quality rather than quantity - not to forget their amazing ability to handle high SPLs and dynamics without sign of strain or compression. And given the price point, the performance is in the ridiculously good territory. Caveats to consider. As one should expect with such a design, Bass response is limited, but sounds deeper than what it actually is. The tweeter is not the hyper-detailed or extended - but the offset there is that it provides for an easy listening and non-fatiguing experience, though I personally would have preferred a bit more in that department. Very well done - highly recommended. I have long said the best testimony a reviewer can give is to buy the product under review, and I intend to buy myself a pair of Hawthorne speakers. The question is which version? Next, I'll be investigating the upgraded version before deciding on what I'm going to buy for myself!